Mary of Carisbrooke is about the daughter of the sergeant in charge of the small military garrison at Carisbrooke Castle on the Isle of Wight when the doomed King Charles I was confined there in 1647. 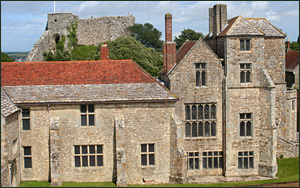 The king made several attempts to escape from Carisbrooke, and the novel imagines Mary as one of a secret band of royalists plotting to help him. A quiet love story weaves through this sentimental tale of royalty, its loyal supporters, and the dastardly Cromwellians who would pull all down. Seventeen-year-old Mary is courteous, kind, conscientious and sensible. As the story begins, she is trying to help a pregnant housemaid retain her position. When the king comes to Carisbrooke hoping for shelter but landing in honorable captivity instead, Mary is awestruck to find herself living under the same roof as royalty. Eventually, after joining the supporters planning his escape, she is able to offer the king her characteristic kindness in person. More important to her even than the king, though, are a handsome young royalist, "tall and slender and almost red-headed," whose laughter brightens her days, and a hypocritical Cromwellian officer who threatens her when she refuses his advances.